This is my first award nomination as a blogger!!! 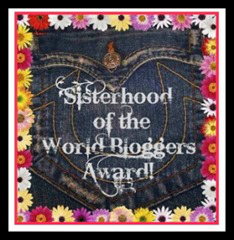 The Sisterhood of the World Bloggers Award recognizes the unique voices of women across the globe. This award, given by bloggers to fellow bloggers, is a way of networking, getting to know one another, and sending a little happiness to other deserving bloggers. I am excited, humbled, and honored for this nomination; I wish I had the words to better express my euphoria. I am thrilled to be recognized by my peers for doing what I love. Thank you, naammeinkyarakhahai, for nominating me for this special award. If you haven’t had a chance to check out https://bepositiveyaroon.wordpress.com, naammeinkyarakhahai’s blog, do so now! Her “random” collections of nail art, quilling, and jokes, are refreshingly unique. Answer the questions the nominator has provided. Do you like your hair to be straight or wavy? Which is the best food that you have cooked till date? Who is your favorite blogger? Why? There are so many excellent bloggers, I can’t name just one. I seem to gravitate toward art, literature, fiber art (I knit), paper crafting, and parenting. I am a huge fan of both Laci Green and Anita Sarkeesian. What I consume on the interwebs depends on my mood. She’s bat-crap crazy and lovingly loyal. I love her quirky sense of humor. Which is you favorite shopping store? Write 5 random stuffs about you. I’m thinking about starting a third blog. Yes! Often in vivid detail. What kind of shoes do ninjas wear? Sneakers. Every day is the best day; most especially are the days I get to spend with my kids. What do you believe are the most interesting/unique thing is about yourself? Which “super power” do you wish you had? Why? Describe your last light bulb moment? What is the most useful advice that you have received in the past 10 years? What is something you have recently learned about yourself that surprised you? Describe something you are waiting for, or looking forward to. To my readers: I’d love to hear your answers to the above questions! I encourage you to add your responses to the comments section. Congrats on your first award. I’m sure many more will be purring your way. 🙂 Thanks for nominating friendlyfairytales! Happy to have another sister. Meow!